Rheumatoid arthritis is a chronic inflammatory disorder that affects the small joints of the body typically your hands and feet. Rheumatoid Arthritis affects the lining of your joints causing painful swelling and inflammation that can eventually result in bone erosion and joint deformity. 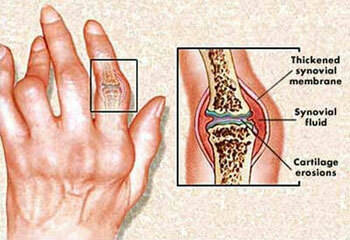 Rheumatoid Arthritis is an autoimmune disorder where your body’s tissue attacks other tissues. It can also affect your skin, eyes, lungs and blood vessels. 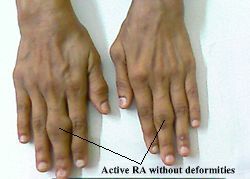 Rheumatoid Arthritis can present at any age although it usually begins when one reaches age 40. Women are at greater risk than men of having Rheumatoid Arthritis. Rheumatoid Arthritis is a disease that can progress slowly usually beginning by affecting smaller joints first like the fingers and toes. As it progresses further symptoms can spread to the knees, ankles, elbows, hips and shoulders and in some cases symptoms can affect both sides. Rheumatoid Arthritis is a disorder that currently has no cure, however treatment would focus on controlling the symptoms and especially in preventing any further joint damage. Osteoarthritis is a chronic systemic condition known as a wear/tear syndrome. 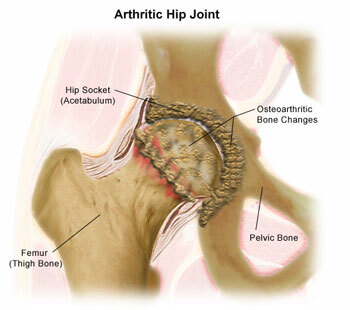 As you age the constant wear/tear tends to wear the joints of the hips and knees. While there is no current cure for osteoarthritis, if osteoarthritis is diagnosed early and treatment is started then the symptoms can be managed and you may even delay or avoid severe damage to your joints. Osteoarthritis occurs when cartilage begins to wear away. The cartilage being an essential part of a joint acts as a shock absorber and enables the joint to move smoothly. When the cartilage erodes away it eventually results in pain and stiffness, swelling and bone on bone movement in the affected joint. The joints tend to become stiff in the morning but begin to warm up after 15 to 20 minutes. As the day progresses and the joints are used the symptoms of pain and discomfort can become worse. Resting the joint provides joint relief. Osteoarthritis currently has no cure, however treatment would focus on relieving symptoms and delaying/avoiding any further joint dysfunction. If one is overweight the symptoms of osteoarthritis may improve as you lose weight. If you have any questions about Rheumatoid Arthritis or Osteoarthritis contact our staff at Dynamic Physiotherapy.